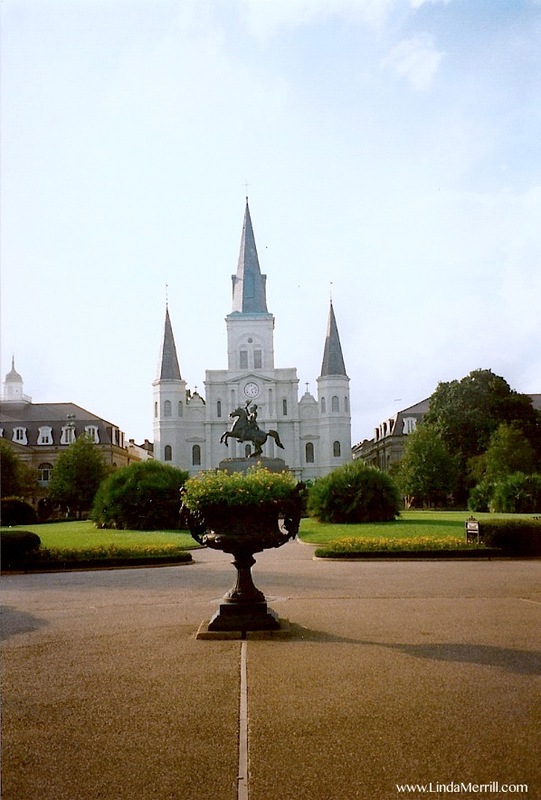 The Cathedral/Basilica of St. Louis in Jackson Square is the oldest Catholic Cathedral in continual use in the United States, having been established as a parish in 1720.
and to take in the local flavor. the St. Louis Cathedral on one side and lots of shops and restaurants. I don’t recall at all what time of day I took this photo of the Cathedral – no one was walking around? I didn’t get to go into the church on that trip and I’m not sure if I will this time either. My travel timing doesn’t work out for me to attend Mass there, though I would like to. 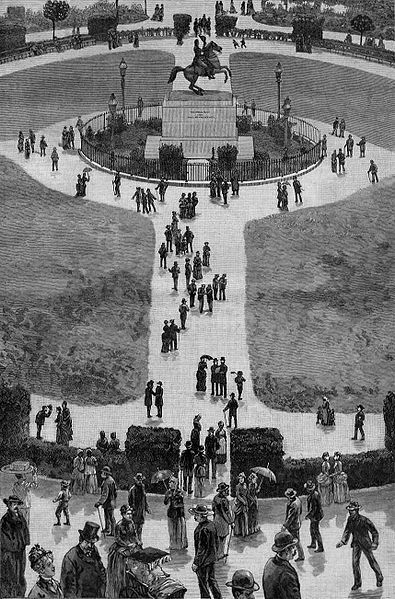 Jackson Square, New Orleans, a wood engraving drawn by W. P. Snyder and published in Harper’s Weekly, January 1885. Jackson Square, looking down river, with St. Louis Cathedral at left. 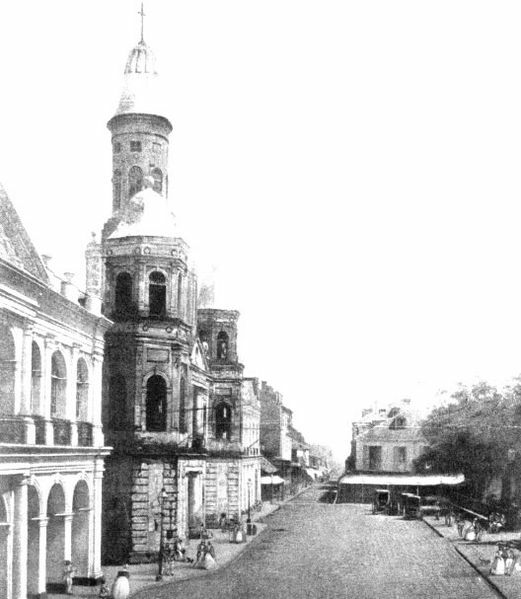 or “View of Chartres Street”. I believe this is the corner of Chartres St. and St. Anne – which is just past the Cathedral to the left. You can see it in the older images above. 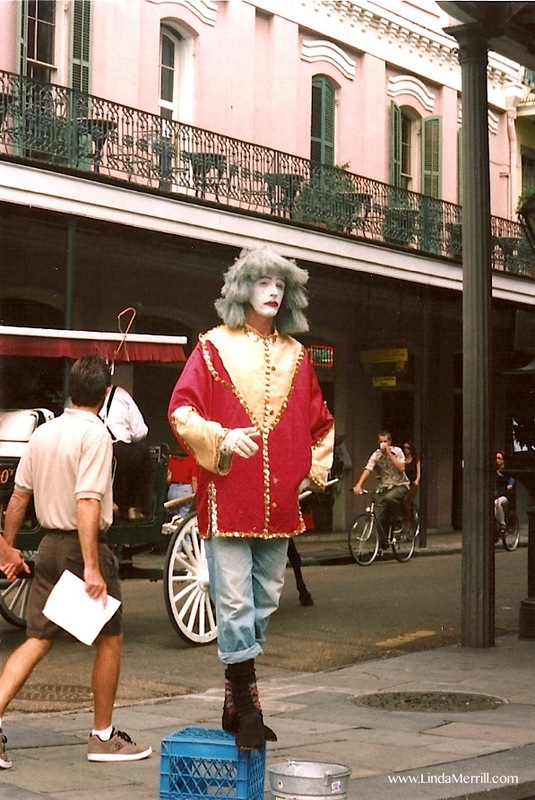 I recall just loving this mime – and of course being a little weirded out by him. How beautiful is the pink stucco building with green shutters and the wonderful wrought iron railings? My favorite aspect of Nola architecture are all the amazing railings! 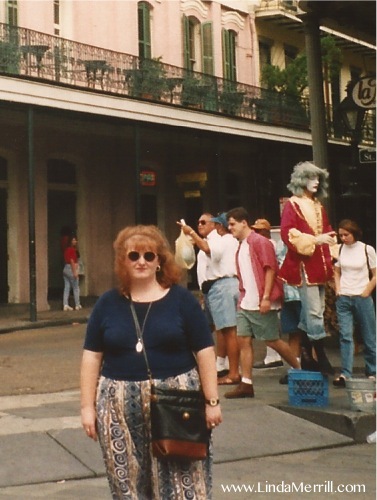 Travel wear and big hair, circa 1996. 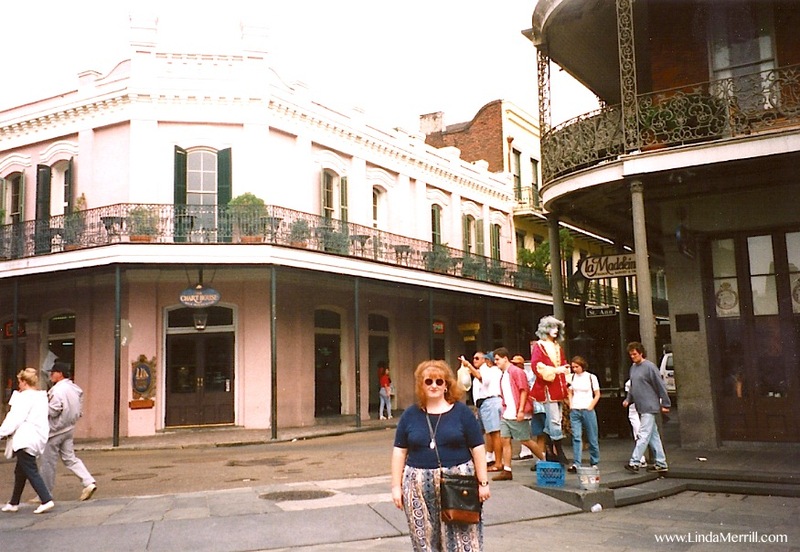 I recall loving those pants – they were super wide leg and very comfy in the warm weather. No idea where this image was taken – but more wrought iron! 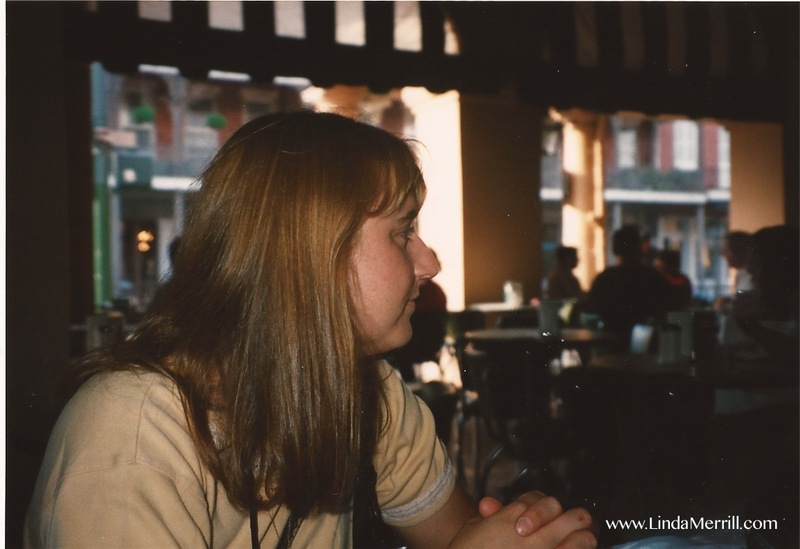 And this was my work colleague Ildi and I, enjoying a chicory coffee and beignets at the famous Cafe du Monde – which must be on the schedule next week, it just must!! Then I recall we went shopping in the French Market and wandered around till we found a local lunch joint for some yummy po’ boys. We also went to a jazz club to hear Ellis Marsalis for a set or two, Jimmy Buffet’s Margaritaville for dinner and wandered down Bourbon Street enjoying a Hurricane (just one!) and the sights. We also went out to either Brennan’s or The Court of Two Sisters for a fabulous dinner, as guests of our colleagues from PBS. 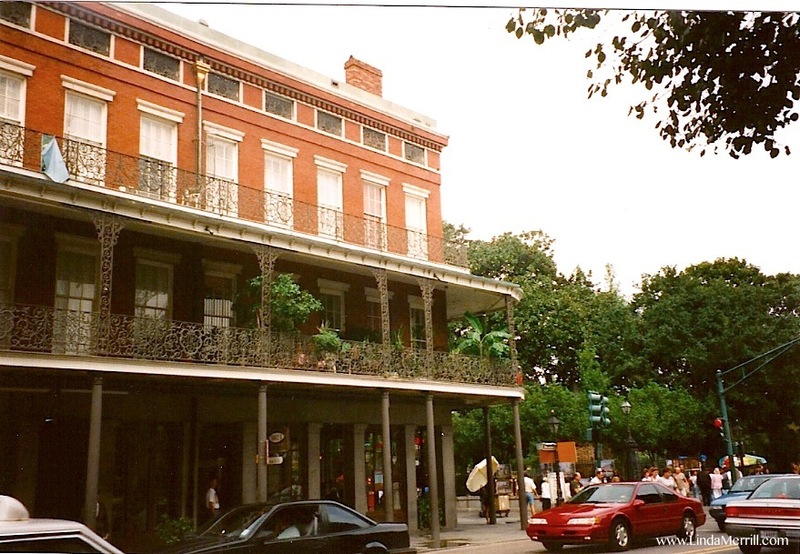 I cannot remember which restaurant it was, but am pretty sure it was one of these two iconic New Orleans establishments.I know we also took a street car through the Garden District – but I apparently didn’t take photos. Hopefully I will be able to rectify that this time! 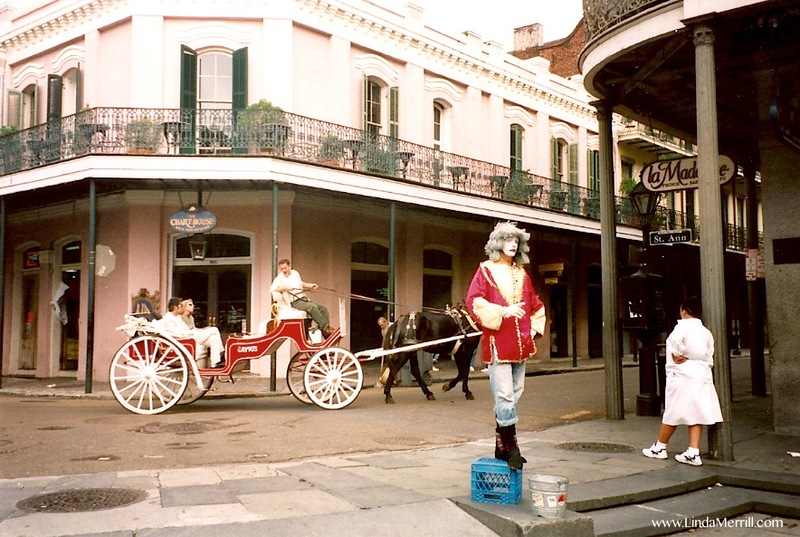 Have you been to New Orleans – would love your recommendations for great places to visit! BTW, for additional Nola goodness, designer and blogger Courtney Price has been sharing some great photos (she grew up there) and tips on the best design shops. Check out her posts here.